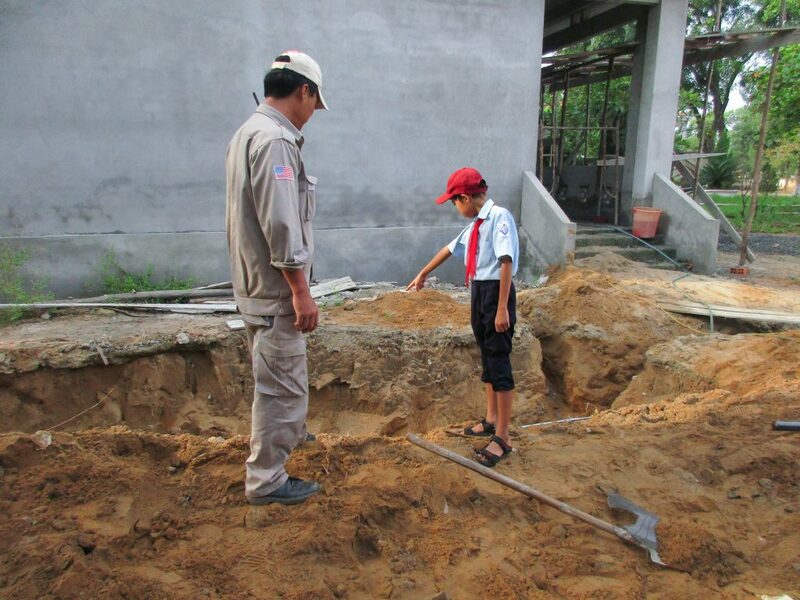 A schoolboy showing EOD Team Leader Le Xuan Tung the location where they took the soil. 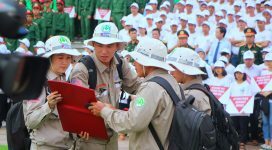 Hai Lang, Quang Tri (30 September 2016) – Watchful schoolboys at Hai Phu Secondary School have helped prevent an explosion of cluster bomb in their school yard on Friday. When they were pouring earth into flower beds for planting flowers Friday morning, the boys suddenly found a cluster bomb that was mixed in the soil which they took from a pit dug up by bricklayers who were repairing the school facilities. The students immediately alerted their teachers who immediately called the UXO hotline number to report the emergency. 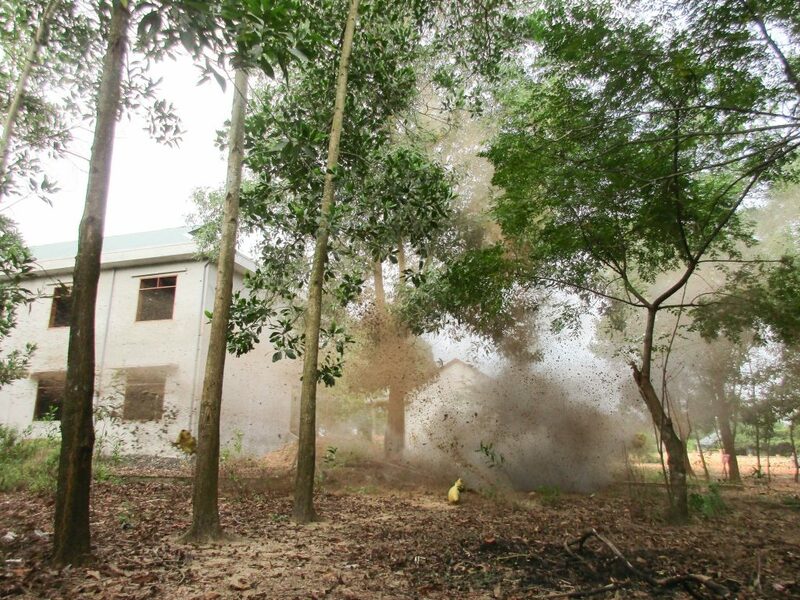 In response to the UXO call-out, members of the Explosive Ordnance Disposal (EOD) Team No.1 led by Team Leader Le Xuan Tung quickly arrived at the school. Checking the area, the team also found two more items of UXO, an 81mm mortar and a hand grenade from the pile of soil excavated by bricklayers. The demolition of the cluster bomb, which is unsafe to remove, is captured by the team’s camera. The EOD team safely destroyed the cluster bomb in place and transported the mortar and the hand grenade to the central demolition site for later destruction. Thanks to the constant alert of the schoolchildren, a tragic accident that might occur to more than 300 students has been prevented. 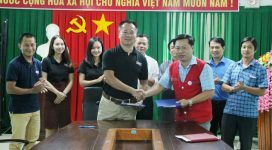 According to Nguyen Thanh Phu, who is in charge of Project RENEW’s Mine Risk Education program, schoolchildren of Hai Phu Secondary School have been exposed to UXO safety messages. In March 2016, a “Safety Day” event was conducted at their school with funding provided by the Irish Aid. 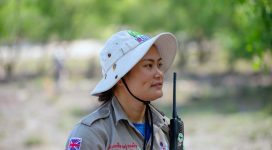 “This explains why these schoolchildren know how to behave when encountering deadly UXO,” said Phu. During the last 10 months of 2016, Project RENEW’s teams have responded to 5 UXO emergencies reported by local students and teachers, resulting in 10 items of deadly wartime explosives being safely removed and destroyed. Six years ago an explosion in a middle school playground in Dong Ha City shook walls and shattered windows but more than 500 students who were in class at the time escaped injury.